In traditional fundraising, charities ask the people closest to them for a direct donation. However, in “peer-to-peer” fundraising, charities encourage those people to fundraise–to ask their personal networks of friends, family and colleagues for a donation on behalf of the charity. Peer-to-peer fundraising attracts new donors to an organisation that were once difficult (or impossible) to reach with other traditional methods. With new donors comes new revenue….but that’s not all. Peer-to-peer fundraising helps deepen the relationship between the charity and their community members…turning them from donors to fundraisers to life-long supporters. BUT, AREN’T THERE SOME OTHER NAMES FOR “PEER-TO-PEER FUNDRAISING”? Peer-to-peer fundraising is also commonly known as “community fundraising” and “friends-asking-friends fundraising”. The term “friend-raising” is also sometimes used when growing the number of community members is the charity’s primary objective. HOW DOES PEER-TO-PEER DIFFER FROM CROWDFUNDING? Peer-to-peer fundraising is sometimes equated with “crowdfunding” which isn’t entirely accurate. When a charity is crowdfunding it usually implies that they are raising a specific amount of money for a specific purpose within a specific timeframe…usually by asking their community for a direct donation. However, if the charity actively encourages their community to fundraise (not just give) to the crowdfunding campaign, then it is considered a peer-to-peer crowdfunding campaign. IS “PEER-TO-PEER” THE SAME AS “FACE-TO-FACE” FUNDRAISING? While volunteer (peer-to-peer) fundraisers will often ask their friends, family & colleagues for donations when they are together in-person, it should not be confused with “face-to-face fundraising” in which a charity’s staff, volunteers or hired third party representatives to ask strangers for donations usually while roaming streets or in public places. 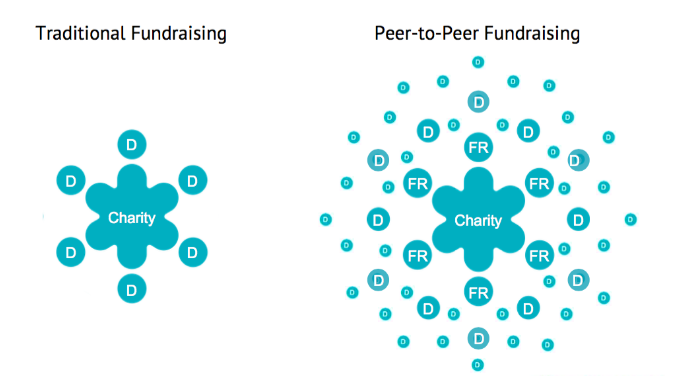 SO, WHAT ARE THE TYPES OF PEER-TO-PEER FUNDRAISING? If you look back at the relatively brief history of peer-to-peer fundraising you would notice that peer-to-peer became mainstream with the onset of charity events that were either produced by charities themselves or by third parties (volunteers) for the benefit of causes they cared about. In the early years of peer-to-peer, people only felt comfortable fundraising on behalf of a charity if they were also participating in a 5K run or a long-distance cycling event. But peer-to-peer quickly evolved and expanded beyond “event fundraising” when charities started encouraging their community of supporters to fundraise “virtually” on their own time and in their own way…doing everything from bake sales to solo mountain climbs. For these programs, charities typically dedicate staff time to support their fundraisers and provide them with creative ideas and handy fundraising tools usually via an online platform. So, while there are many types of peer-to-peer fundraising, they all have the same core principle: charities encourage their current supporters to fundraise by reaching out into their personal networks. Interested in learning more about Peer-to-Peer Fundraising? Visit the PeerWorks Academy page!